WAIST HIGH: Happy 25th Birthday Hyaena. 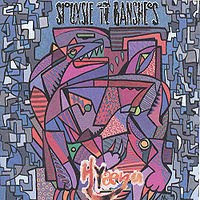 The sixth album by Siouxsie and the Banshees, Hyaena features the unmistakable sound of Robert Smith on guitar. Smith had replaced John McGeoch in November of 1982 and left the band before Hyaena's release to return to The Cure. He was eventually replaced by John Valentine Carruthers. Hyaena includes "Take Me Back," a remake of "Dear Prudence," "Swimming Horses," and the stunning WH favorite "Dazzle." Steve Sutherland of Melody Maker once called Hyaena "an immaculate conception." Hyaena was remastered and re-issued in April of this year. "This new remaster, bonus material and suitably ornate notes from Paul Morley make this another exemplary addition to Banshees' reissue series, demonstrating the regard in which they still hold their audience."